Rows of open stalls with bright red plastic blinds; giant yellow pulleys suspended from the warehouse ceilings; more wires and plugs than the average person sees in their lifetime. 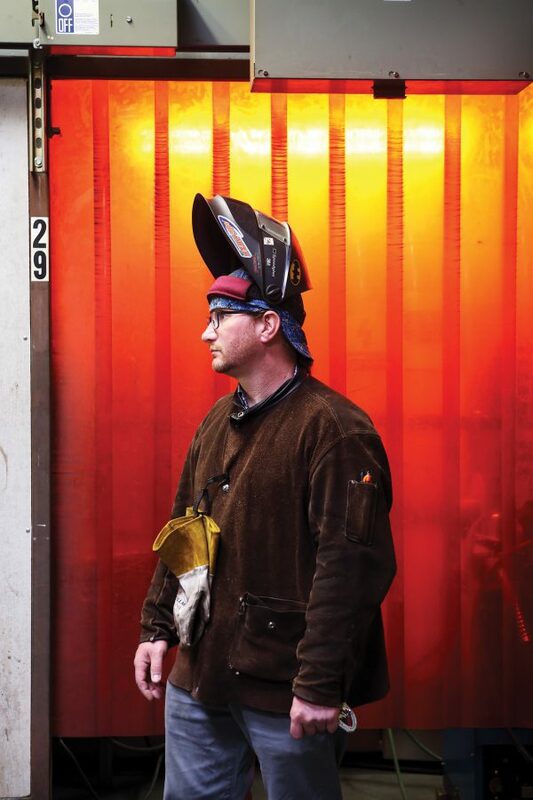 It’s a feast for the eyes inside the welding shop at Clackamas Community College, but to welding instructor John Phelps, it’s just another day in the classroom. The shop is quiet. Fall term won’t start for another two weeks, but Phelps is already trying to figure out how he can squeeze a few more students into his classes. He hates to turn anyone away if they want to be there, and he’s found some creative ways to build makeshift workspaces to accommodate the extra bodies. With an enormous nationwide shortage in the labor force of skilled tradespeople, not a single person who graduates from one of these programs isn’t going to find work. “It’s all I’ve heard for my entire welding career...we can’t fill the need fast enough. Even if they hired every single person that came into a program, we’d be short,” Phelps says. The Bureau of Labor Statistics agrees. According to their projections, Oregon will need to fill over 20,000 welding positions between 2016 and 2026. 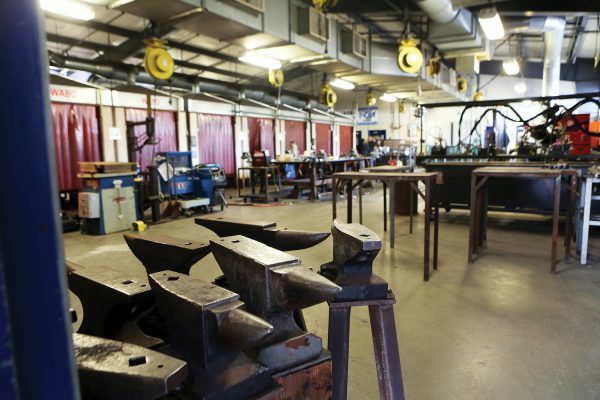 Oregon legislators are taking steps to build more robust opportunities and interest in Career Technical Education (CTE) at the middle and high school levels in hopes that more young people will choose to enter skilled trades programs after they graduate. Governor Kate Brown released plans for the Future Ready Oregon program in February 2018, which will prioritize funding for CTE programs and provide work-based learning opportunities for students at the high school level. This plan is part of the holistic cradle-to-career education model that Brown has been cultivating in her efforts to improve Oregon’s public education system as a whole. By removing as many barriers as possible to allow students to choose a career that doesn’t require a four-year degree, and still provides a living wage, Brown aims to increase Oregonian’s access to quality jobs, and support local industry needs. One of the largest barriers to students entering trade programs across the state is, of course, money. While community colleges are vastly more affordable than four-year universities, they are not immune to the constantly increasing costs of higher education. The average statewide cost per credit hour for an in-district student is nearly $100, not including fees and supplies. In 2015, the Oregon state legislature passed a bill to fund the Oregon Promise Grant, which allows students who have graduated or passed a GED test within the last six months to receive state funding, in addition to any other financial aid for which they qualify, if they enroll at any Oregon community college. This has brought the cost of education down dramatically for students fresh out of high school, but according to the Oregon Higher Education Coordinating Commission, nearly two-thirds of students attending community college in Oregon are age 22 or older. For students enrolled in CTE programs, the average age is much higher. For students in John Phelps’ welding programs at Clackamas Community College, the impact of the increased tuition and lack of resources for older students means that attaining the education they need to provide a better life for their families is getting harder. PELL grants and other financial aid options might cover the cost of tuition, but that only gets his students a seat in class. To be fully prepared to learn on the first day, they need to have practical gear, like jackets, welding hoods, gloves, and safety glasses. It doesn’t seem like much, but for some students, it can mean the difference between staying in the program or dropping out. “The cost of education, unfortunately, doesn’t get smaller. It continues to get more and more expensive, and when we’re able to help a student overcome a financial hardship, they can get focused on why they’re here and what they’re trying to learn,” says Phelps. Phelps learned about the OEA Foundation grants a few years ago, after a fellow colleague and OEA member spoke at a faculty association meeting. After listening to her experience with the process, and how much it had helped the students on her caseload, Phelps decided taking time to apply for the grant was worth it if it could help his students with some of their financial burden and be prepared for class. As it turns out, the application process to get an OEA Foundation grant is fairly simple. “I went through the process, and it was not very challenging at all, so this last year, I just decided that I wanted to help as many people as I could, and that’s kind of where it started,” says Phelps. Phelps has become a champion of the grant program on campus. His enthusiasm for helping his students has caught the eye of many of his colleagues. Counselor and former local president Casey Sims has seen the impact that these small-scale grants have had on Phelps’ students in terms of transforming their education - and their mindset. “There are intangible benefits other than the functionality of the tools. There’s a sense of pride in having your own tools...Some people might take their tools home and show them to family members...and it fosters a sense of success,” says Sims. In the Community Center, Sims is responsible for connecting students with resources to help them succeed in schooland beyond, but it can be hard to identify students who need help unless they ask. “One of the things that John does really well is build relationships with his students, really deeply and authentically, and he then elicits information about what would be helpful to them, so people don’t have to feel like they’re at the end of the road before we can consider something like this,” says Sims. in his local. “One of the important things I want to do this year is demystify the application process because it’s not so difficult... and every OEA member has access to it,” says Sims. In the community college setting, it is easy to become siloed into your own building or department. John Phelps has been able to build stronger connections with his fellow faculty members because of his experience with the OEA Foundation grants. He has become a go-to person for other educators who have questions about the process, and has been asked to speak about his experience with them at faculty meetings. 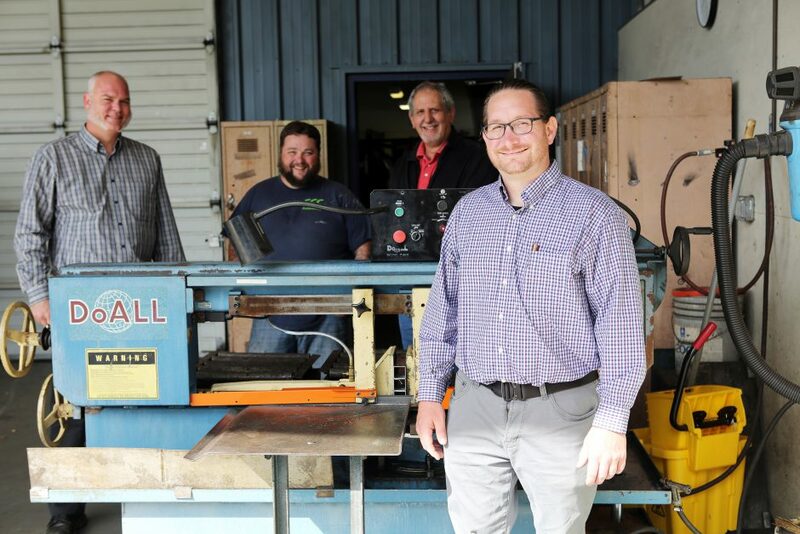 Phelps has also begun working with his colleagues in the Automotive and Collision Repair Center to find out if there are overlapping needs that he can help students meet so that they are able to make their grant dollars stretch as far as possible. 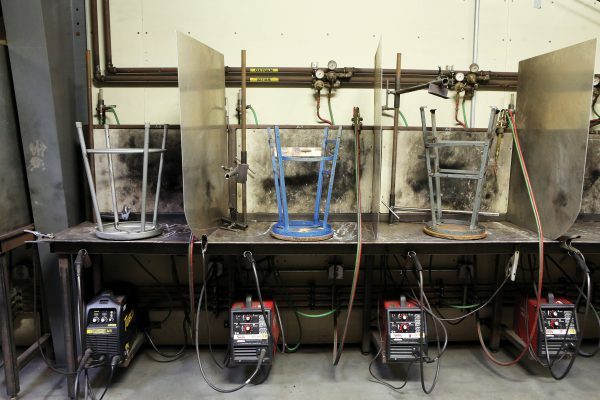 Welding is a huge piece of the auto repair curriculum, and many of the students who are enrolled in his classes are also part of the 18-month Automotive and Collision Repair certification program. Over the last two years, he has helped nearly 30 of his students to get the supplies they need, and he has gone as far as working out a deal with a local industrial supply company to build a custom package for students so that they can get the basics and stay within the $100.00 limit of the OEA Foundation grant. The impact of having all their classroom materials notwithstanding, Phelps has discovered that receiving an OEA Foundation grant has an even greater impact on the confidence of his students. “I’ve noticed over this last year, going through the steps of applying for this grant, that it’s almost like a gateway or a stepping stone for students to feel like ‘I can apply for scholarships, and I can apply for other grants’. 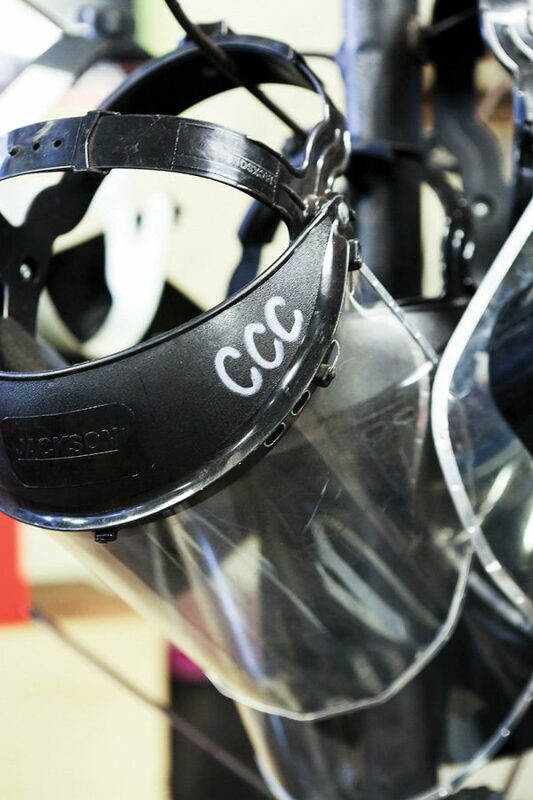 In the CTE world, it tends to be very challenging to get [students] to apply and access funds and benefits...this is the first step,” says Phelps. Phelps says that one of his greatest rewards an educator has been the phone calls and emails from former students, thanking him for helping them get the tools they needed to get a well-paid job. He has even had some of them come back and talk to incoming classes about the program and how wonderful it was to have the help of the OEA Foundation grants. Phelps hopes that seeing other success stories will encourage more of his students to come to him to find out how they can get help too. Last year, for the first time in OEA Foundation history, a community college reached the maximum annual grant amount. Can you guess which school it was? John Phelps’ dedication to helping his students has prompted OEA Foundation to make some changes to their guidelines for community colleges this year. OEA Foundation receives hundreds of applications every year, but a very small number of those come from community college educators. Because of the diverse needs and greater number of students on community college campuses, the OEA Foundation Board voted this year to expand the maximum annual total grant amount for community colleges from $2,000 to $5,000 , and to extend the end of the grant year from June 1 to July 15th. To learn how you can start helping your students succeed, visit www.oregoned.org/oea-foundation. If you have any questions about the application process or guidelines, call 503-495-2164.